Bovey Castle, situated on 368 square miles on Dartmoor National Park, this 65-room and suite hotel, built in 1906, once a private residence is about as impressive as it gets. 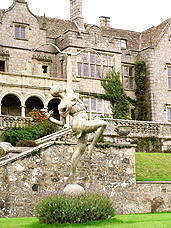 The London Outpost of Bovey Castle is proud to announce that it has a gorgeous new sister hotel in Devon, England, called Bovey Castle on Dartmoor National Park, www.boveycastle.com, that opened in April 2004. Although other commitments kept us from visiting the hotel when it first opened, Edward F. Nesta and I finally had the opportunity to experience this stunning hotel in November 2004. Situated on 368 square miles on Dartmoor National Park, this 65-room and suite hotel, built in 1906, once a private residence is about as impressive as it gets. It offers the best of manor life where guests can wander through the magnificent grounds wearing Wellies, or “dress to the nines” in the evening, of which we had the opportunity to do both. 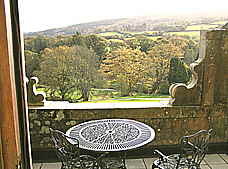 Bovey Castle offers guests the opportunity to participate in a variety of leisure activities including Archery and Pistol Shooting, Badminton, Boule, Falconry displays, Fishing, Golf, Horse Riding, use of Mountain Bikes, Shooting, Swimming, Sauna, Snooker, Tennis, Balloon Flights, Volleyball, Helicopter Tours, Sporting Clays, they can take a Dartmoor Safari, indulge in Spa treatments, Wine Tastings, and of course, partake of daily Afternoon Tea. In addition to the seemingly endless Full English Breakfasts, Executive Chef David Berry changes the restaurant menu nightly, which offers guests the choice of selecting innovative cuisine or traditional British favorites. The staff is courteous and eager to assist. We stayed in the Easdon Suite, located at the top of the intricately carved wooden staircase. The suite overlooked the moors and the rolling hills of the golf course. The large beautiful room had a comfortable feel to it, with yellow walls, red carpet, a gold sofa adorned with attractive Oriental pillows, a coffee table was placed in front of the sofa, a primrose plant sat on a side table by the sofa, a lipstick red chair with sumptuous cushions positioned by the fireplace, and Staffordshire dogs, candlesticks and a fern plant graced the mantelpiece. Gold and deep red crewel fabric framed a wall of windows, and there was a dreamy window seat covered with red fabric with red pillows in the corners that invited guests to curl up with a book on a cold winter evening or just enjoy the marvelous views of the moors. There was also a Secretary desk that held English china, a small tray with two glasses and a crystal decanter of sloe gin made at Bovey Castle, two anthurium plants on either side of the Secretary, and a rectangular dining table with four chairs. A 1920’s style painting was on one wall, and there was a ruby red amaryllis on a small table with a combination CD/radio. A sofa table was positioned along the back of the sofa, and had a vanity mirror, stationery and a tray with bottles of water and two glasses. 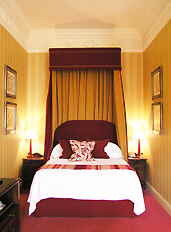 The king bed had a canopy of red and gold fabric and a high headboard in red fabric that was fit for royalty. One evening when we returned we found a bedside treat of a jar of Bovey Castle Homemade Fudge on a nightstand, to add to our sweet dreams. There was a flat screen television, a large mirrored armoire, and a table with a tray, kettle, and tea and coffee makings, as well as miniature shortbread biscuits in a porcelain container that were replenished daily. A French door opened onto a large terrace, which had a round table and two chairs with stunning views of the grounds. The large bathroom had black and white flower photographs on the walls, there was a deep soaking tub and combination shower with rain showerhead, a scale, waffle-weave robes, slippers, hairdryer and an assortment of bath amenities. 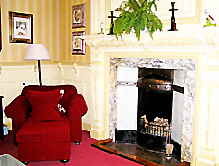 The hotel is a symphony of elegance and style, from the gleaming woodwork to the many public rooms where guests can relax by a fireplace, to the small details, including two canaries in a birdcage in one of the rooms, to paintings, fresh flowers, antiques and plants, that make Bovey Castle an inviting place to stay. Outside the exquisite gardens, lakes, and sculptures beckon guests to come and explore its beauty. Read our articles on Bovey Castle and London in Destinations, Hotels & Resorts, Wine Cellar, Restaurants, and Chefs' Recipes.